With the group stages of the 2019 Al Kass International Cup now complete, Sunday will see the knockout rounds begin, and already we have seen some shocks. Two of Europe’s biggest names - PSG and Bayern Munich - were among the favourites going into the competition, but both finished bottom of their groups. PSG arrived in Doha with high hopes of claiming a fourth championship, but the most successful club in the history of the competition will not be progressing, having been denied by a late equalizer by last year’s runners-up Kashiwa and then suffering a 5-2 hammering at the hands of Roma. The imperious Italians followed that impressive win over PSG with a more workmanlike 2-0 success against Kashiwa. They go into the knockout stages as the only team with a 100% record from the group phase, which makes them favorites to lift the trophy…. although much can change. Kashiwa, who also progressed from Group B, have once again impressed this year and they will be hoping to go one better than in 2018. They are technically gifted and difficult to break down, so even though they didn’t top their group, they command fear and respect in equal measure. Group A winners Glasgow Rangers looked superb when beating Raja Casablanca 3-0 in their opener but they were then defeated by hosts Aspire Academy. They made several changes for that game, including leaving influential Chelsea loanee Nathan YoungCoombes out of the starting line-up, so perhaps not too much should be read into that defeat. Kai Kennedy has been superb for the Scots and Matt Yates has netted in both of their matches, so if Rangers can produce the form they showed in their opener they could go close. Al Kass analyst and former Manchester City star Nick Summerbee believes hosts Aspire Academy could be a threat the longer the competition goes on. He said: “These guys have the best facilities and they’re looking to continue their progress. They play against all the top sides, they’re playing big competitions all the time. They are very grounded and that’s because Aspire makes them grounded. There’s no big heads or anything like that here at all. It’s all very professional - you will not find anywhere more professional.” Aspire International, a team that grew out of the Aspire Football Dreams project, twice won the competition, and Aspire Academy would love to follow in their footsteps. Real Madrid, who won the title two years ago, are the only former winners left in the competition, and the Group D winners have to be respected. They have been involved in two close games to date, but on both occasions they passed the ball neatly, and the likes of Pau Russo Aran and Andri Gudjohnsen have looked particularly impressive so far. Spartak Moscow progressed from the group along with Real. Skipper Ilya Golyatov has proven to be a real handful so far with three goals, which makes him the competition’s leading scorer, and Sviatoslav Kozhedub looks a fine midfielder. The Russians have played some good football and demonstrated their ability to give big clubs a real test when pushing Real Madrid hard in their opening match. Group C winners Altinordu have been the surprise package so far. Coached by Ilker Seven, Altinordu are not even in the top-flight in Turkey but they have an academy that is the envy of all other clubs in the country. 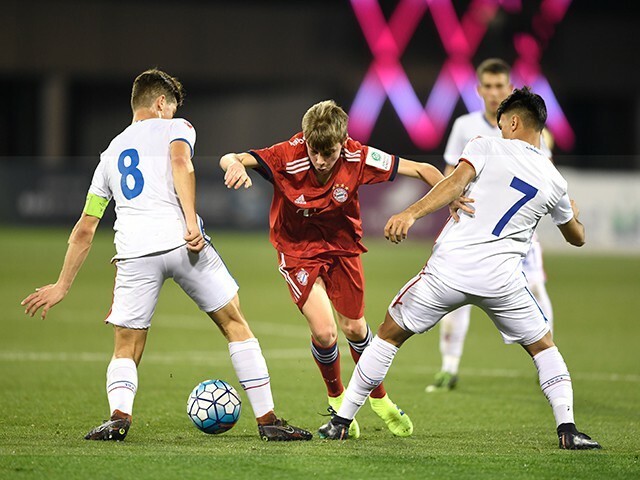 Concentrating on producing only homegrown talent, Altinordu are developing many talented youngsters and their creative young team defeated Etoile Sahel before holding Germany’s leading club Bayern Munich. Former Marseille and Sunderland full-back Chris Makin – also an Alkass analyst - believes Altinordu have one of the best players in the tournament so far. He said: “Salih Kavrazli has been very impressive. He has great running power and terrific dribbling skills. “Other players who have impressed me are Aslan Mutaliev of Spartak Moscow, Roma captain Filippo Trippi, and Kai Kennedy of Glasgow Rangers.” Makin, like most who have been involved in the Alkass Tournament, has been greatly impressed by what he has seen. Italy in 1982, is a regular at the tournament and he has been impressed once again by the quality on show. He said: “I have been coming to the Alkass International Cup for eight years now, and have seen every tournament. The event is extremely well organised, and of a very high quality. A lot of top teams and talented players from Europe, Africa and Asia come here and we can see that, in time, some of these young hopefuls can develop and be tremendously successful in their careers. “The culture of football has changed significantly from when I was playing. Football is more spectacular these days. There are maybe less stars now compared to my time, but football has become more rapid. In the eighties, the game - and consequently the players - perhaps tended to be more static than today.” Altobelli could well witness an Italian success in Friday’s final, if Roma can keep up their impressive start, but there are seven other teams who also have high hopes that they can be the ones to lift the trophy. As the quarters get under way, it’s all to play for.